Fire salamander is a name given to a group of related species of salamander of the genus Salamandra from across Europe (excluding the fringes such as Britain and Ireland) and North Africa round to the Levant. The fire salamander is a terrestrial amphibian that only really goes to water to breed, spending most of its relatively long adult life rooting around in damp leaf litter looking for prey. They rarely come out during the day (unless it has recently rained or they are breeding) and actively avoid higher temperatures by burrowing into the litter or under logs if it gets too warm. In warmer climates they become inactive during hot months and in cooler climates they do the same in colder months. The fire salamander lays eggs (timing dependant on species and location) directly in to water that hatch immediately as they are deposited into the larval form, which is completely aquatic although the stage at which the larvae emerge at varies widely (some species emerge as the adult “metamorph”). Normally larvae are about an inch long and metamorphose into the adult form when they have roughly doubled in size. 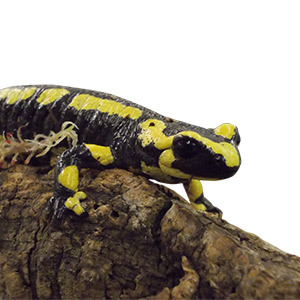 The adult fire salamander reaches between 5 and 12 inches in size. Most species of fire salamander inhabit lowland forests and woodland although some species prefer higher forests and some are alpine. There are also some species of fire salamander that can inhabit quite arid regions such as the Levant. The fire salamander has quite a large territory for such a relatively small animal and males will defend this territory during breeding season so as large an enclosure as possible is best to allow natural behaviour. The fires salamander actively hunts its prey through the forest floor litter. A large enclosure will allow this behaviour in captivity. 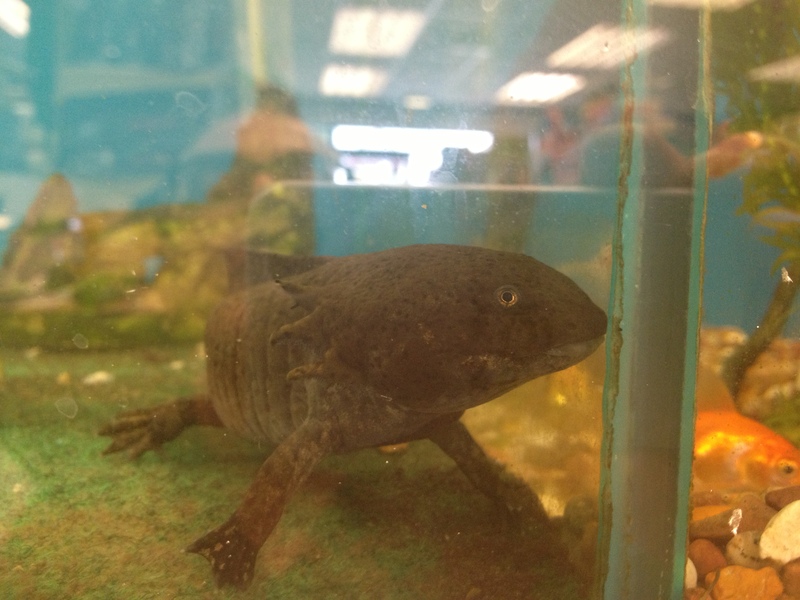 A minimum of 45cmx45cm for the smaller species is OK but larger is better. Glass enclosures work best due to the high humidity but wood (melamine) could be used if very well sealed (the surface as well as the edges). The fire salamander hides away during the day so lots of hiding places (logs, cork bark etc.) will be appreciated. The fire salamander is generally a forest animal and a substrate to mimic this works best. We use a mixture of coir, bark chips, leaf litter and moss to create a varied forest floor effect. Others use more utilitarian set ups, particularly some breeders and if the animals are breeding then hey ho, who am I to argue. I just prefer a natural looking set up for display. A completely natural set up with drainage media, bio active substrate, detrivores in the soil to dispose of waste and plants to use the nutrients produced would also work very well although I find I end up focussing more attention (and expense) trying to look after the plants than the fire salamander! The fire salamander does not like temperatures much above 20C. Some alpine species in particular will not tolerate higher temperatures and must be kept below this. All species should be kept no higher than the low 20s with a night time drop of up to 10C. So in a modern, well insulated house it is unlikely that extra heating is going to be necessary. If you have a particularly cold house (for instance a wife that has the heating off and the window open when it’s minus 4C outside) then a small heat mat may be necessary but if this is the case a thermostat is an essential. The fire salamander is nocturnal. Specialist lighting is not required. A day night cycle is beneficial but in a glass vivarium natural light will provide this. Of course in a display vivarium lighting can make all the difference to the look and modern LED lighting works well here. Units that switch between white daytime lighting and blue night time lighting work well and look good. Of course if you go for a bioactive set up with real plants then you will need lighting to stimulate plant growth. The fire salamander actively hunts and eats invertebrates such as worms, insects, spiders etc. The key is variety. Offer a range of foods including crickets. calci worms, wax worms, meal worms etc. Gut loading the live food is always a good idea but supplement powders should not be necessary if the diet is varied. A diet of just crickets for example is bad idea and supplement powders would then be necessary. Regular misting of the enclosure to maintain humidity (they require high humidity, especially in the substrate but not “wet”) will also provide all the free water the fire salamander needs. A water dish is only necessary for breeding. If you put one in at any other time they are unlikely to use it. For smaller or newly metamorphosed adult fire salamander smaller prey items will be more appropriate, such as fruit fly, smaller calci worms, white worms etc. For a larval fire salamander a range of aquatic foods are available such as daphnia, bloodworm, white worm etc. Most are available live or frozen. So the fire salamander makes a fairly easy to care for, low cost animal to keep. However as with all animals remember you are taking on responsibility for its care for the rest of its life which in the case of some species of fire salamander can be up to 30 years in captivity.